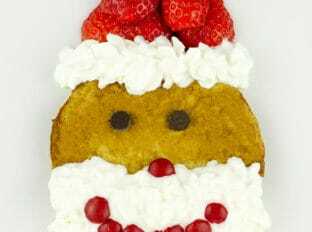 Delicious homemade Gingerbread Pancakes dressed up as Santa! Quick, easy, and so cute! Another month, another #FoodieMamas recipe for you and this month it we feature strawberries. 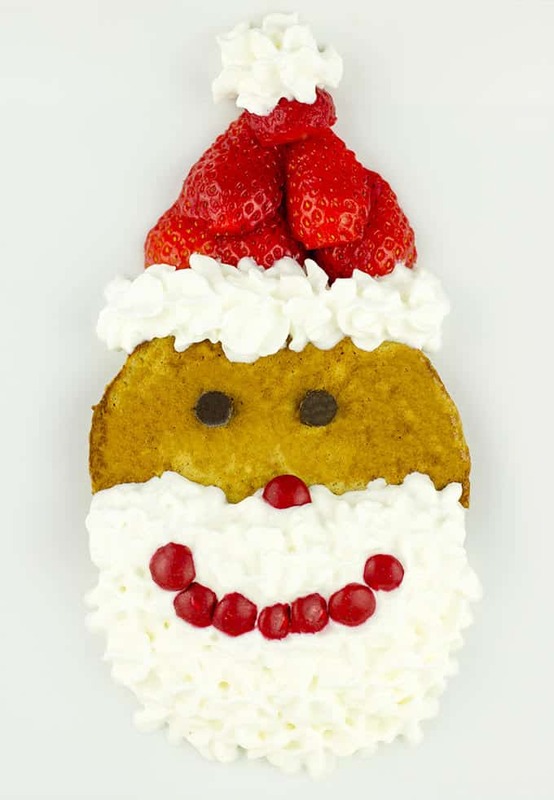 I had planned on some strawberry cheesecake filled french toast for you all but then it occurred to me that this is the time of year we make our traditional Strawberry Gingerbread Pancake Santas! So I had to share since it is a family favorite here (even my husband requests Santa pancakes when I am making them for the kids). So without further ado, Santa pancakes! I am currently on the way back home for the holidays, so exciting to see all the extended family, the kids are going to Disneyland and lots of people around means a little bit of rest for the weary…. psst the weary is myself and my husband. Hope you all are having a fantastic holiday season so far! I think I am going to be sad once New Year’s Eve passes and all the holiday foods become a memory. At least I get to look forward to spoiling you all with Valentine’s Day treats! With a hand mixer beat the heavy cream and powdered sugar together for 2-3 minutes or until you get stiff peaks. Put into a piping bag with a star tip. Put the pancake onto the plate and pipe small amounts in the shape of his beard. Pipe small stars onto the top of his head. Pipe a small amount on top of the strawberry triangle as the top of his hat. Add 7 M&Ms in the shape of a smile. Add one as his nose. Add two chocolate chips, point down as his eyes.